For an ADD survivor, I can get quite focused. Finding the perfect black pump in one shopping trip. Finishing George R.R. Martin books in one weekend. My newest focal point is Draw Something. 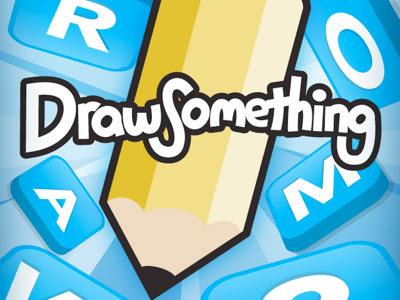 It's a free IOS and Android app that's essentially Pictionary for your phone. I'm not sure why Pictionary didn't create it. They're probably asking themselves same question since Zynga purchased the company that created Draw Something for more than $200 million last week. Sometimes you really are the only one who can see what you're drawing. How were the motion marks on this not a clear giveaway? When you begin playing, you have a limited number of colors. As you make successful guesses, you earn coins to buy new colors. Purchasing green was obviously life changing. Lil' Wayne's people have already contacted my people. Although hands are apparently my Achilles' heel. A few of my favorite people on the Internet provide the most entertainment. Thankfully they have many other spiritual gifts. Because clearly finger painting may not be one of them. This obsession has even affected my "real life." For the record, our game streak at that point was 1. A few opponents are ridiculously skilled. Michael is one of them. He's one of the few I let finish the drawing before I attempt a guess. I want to see it unfold. The downside is when playing against someone that talented, you take your own attempts at artistry as seriously as...anything you take seriously. I mean...it's a BUCKET. I'm confident this addiction will pass. Just like Fun Dip. Or the elliptical. Have you ever become wrapped up in the same way - with a book, game, habit? Do share in the comments so I can be enabled. Note: I'm "jamiesrabbits" if you want to enable me even further.